For the management of leg ulcers. Where venous insufficiency exists, the paste bandage should be adjunct to the graduated compression bandaging. For the management of chronic eczema/dermatitis where occlusion is indicated. 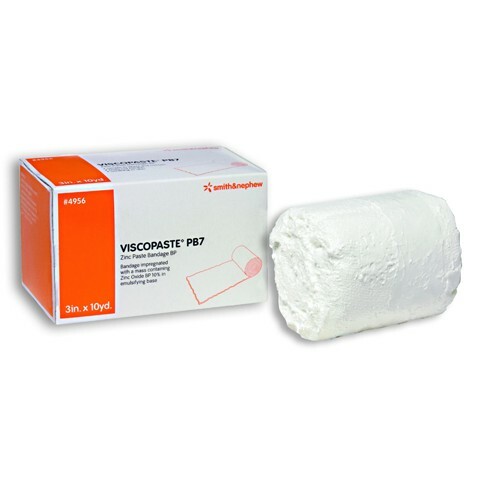 Where venous insufficiency exists, Viscopaste PB7 may be used under graduated compression bandaging, after first assessing the patient to exclude arterial disease. The use of Doppler ultrasound is recommended for this purpose. Compression bandaging should not be used on patients who have arterial disease (ABPI<0.8) and is not recommended for use on diabetic patients with advanced small vessel disease. Failure to detect reduced arterial flow can result in pressure necrosis, amputation, or even death. The risk of a patient having arterial as well as venous disease rises with age. The skin of leg ulcer patients is easily sensitized to topical medicaments - including preservatives. Sensitization should be suspected in patients, particularly where there is deterioration of the surrounding skin. Such patients should be referred for a specialist consult. I ordere a specific bandage product and expected it to take several days to arrive and it was here in just a couple of days. Wowed my expectations. Having used several different brands of Zinc bandages for Unna Boots, this is by far the best bandage for me. 1. The zinc is really applied within this bandage allowing the bandage to be formed around my leg better than some of the less expensive zinc bandages. The whole bandage does not creep down my leg during wear. 2. The guaze bandage itself is more conforming and forming than the less expensive versions. 3. After removing the bandage, there is actually zinc left on my skin and on the bandage. No dry bandages. The one downside is that it is messier to apply...but that is minor compared to the benefits in my wound care (ankle ulcers). The Viscopaste Zinc Paste Bandage by Smith & Nephew is a quality product with positive wound care results being used to dress venous ulcers.